A tubby panda bear becomes a kung fu master. A snail races in the Indy 500. A forgotten garbage-robot saves humanity. Our cultural products for children these days often reflect the fact that we live in the age of empowerment. It’s become something of a cliché, frankly — the outcast or nobody who wins the big race and/or saves the world. And at first glance, The LEGO Movie, as brilliant as it is, appears to be no different. The film’s hero, an average construction worker named Emmet, is told that by finding a sacred object, called “the Piece of Resistance,” he has fulfilled a prophecy and become “the Special,” the most interesting and important person in the universe. Wielding the Piece of Resistance, the Special is to lead a rebellion against the dark forces of President/Lord Business, who rules LEGO land with an iron (plastic) fist. It’s probably no coincidence that the supremacy of the magic-feather syndrome in children’s movies overlaps with the so-called ‘cult of self-esteem.’ The restless protagonists of these films never have to wake up to the reality that crop-dusters simply can’t fly faster than sleek racing aircraft. Instead, it’s the naysaying authority figures who need to be enlightened about the importance of never giving up on your dreams, no matter how irrational, improbable, or disruptive to the larger community. Epplin contrasts these magic-feather narratives with Charles Schultz’s Charlie Brown comics and films. Because Charlie Brown, for all his belief in himself, remained forevermore an adorable loser who had to learn to be happy with his lot in life — to accept his place in the Peanuts’ Great Chain of Being. Other films have carried the torch of exceptionalism to varying degrees, In Monsters University, for example, adorable cyclops Mike Wazowski dreams of becoming a world-class scarer — only to discover, ultimately, that he’s better off as a functionary, leaving the scaring to the truly talented one, his hulking beast pal Sulley. In The Nut Job, Surly Squirrel uses his wits to get his own food for the winter, in direct opposition to the collective needs of the rest of the park’s animals; even though he eventually learns to be a begrudging team player, his superiority is never really in dispute. The LEGO Movie, however, takes a different approach. The film opens on a scene in which the great, Gandalf/Morpheus-like mystic Vitruvius (voiced, hilariously I might add, by Morgan Freeman) makes up the prophecy about “the Special” on the spot, as he’s being terrorized by Lord Business. The special-ness of The Special is, therefore, bogus right from the start; when our protagonist Emmet starts to realize his destiny later on, we understand that he’s living a fake dream. Indeed, the terms here are so blunt, so direct — “the Special” is an expression that can’t even bother to be syntactically correct — that they feel like digs at the very artificiality of the narrative of self-esteem. And so, just as the film plays like a spoof of many popular genres (of superhero movies, of quest narratives, of dystopian sci-fi, etc. ), it also plays like a parody of the you-can-be-anything-you-want school of storytelling. The film also acknowledges the inherent double-standard in the idea of ordinary people becoming extraordinary: At one point, the heroine Wyldstyle tearfully reveals to Emmet that she herself was looking for the Piece of Resistance, hoping that she would be the Special. I can’t begin to describe how remarkable and rare a confession this is, coming from a heroine of a kids’ movie. It’s something these kinds of narratives rarely address — the angst of the dreamer who isn’t the one to fulfill this fictional destiny, even though they’re clearly more suited for it. (Wyldstyle actually is powerful and brilliant, unlike Emmet.) So, even as it purports to present a self-esteem narrative, The LEGO Movie dares to suggests that for every ordinary schmoe who gets to be special, there’s someone more deserving who doesn’t. So, is The LEGO Movie an exceptionalist narrative in disguise — a film that purports to be about a zero becoming a hero while mocking that very idea? No, because the film has, I think, a different agenda. It wants to take the self-esteem narrative to its logical extreme. Unlike other movies, it refuses to shy away from the social implications of saying that everybody’s special. Instead, it shows it. In the midst of the movie’s climactic battle, after Emmet finds out that he isn’t the Special — that no one is — he tells the people of LEGO land that they’re all special, and he inspires them all to break their chains and start creating and building. As a result, the people rise up, and start conjuring up cars, planes, weapons, all sorts of crazy vehicles and other instruments and whatever else in their battle against the forces of Lord Business. As a result, something rather politically loaded, almost transgressive, emerges. It’s a downright proletarian LEGO revolution — right at the climax of that most capitalist of film genres, the toy-based children’s movie. (Remember, the movie’s villain is named Business.) It is, of course, a fantasy of equality and revolution, but it’s in keeping with the disruptive, anarchic spirit of the film itself. In other words, after exploring the simmering debate between stories of self-esteem and stories of exceptionalism, the movie settles on the self-esteem side, but with a self-aware wink. Narratives of exceptionalism argue that if everybody’s special, then nobody is. 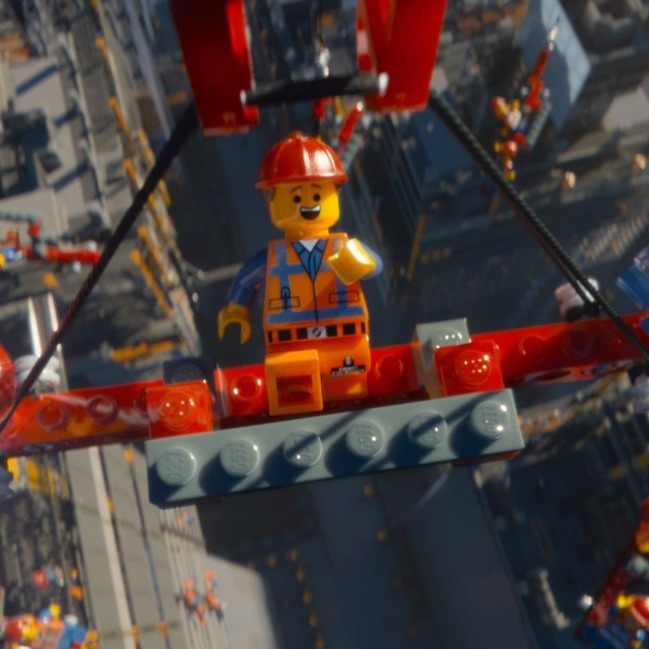 To that, The LEGO Movie offers a sly retort: Everybody IS special, BECAUSE nobody is.